Olympia Time: How much contemporary knowledge of the Mashel Massacre was there? How much contemporary knowledge of the Mashel Massacre was there? I've reread Stephen B. Emerson's essay at Historylink.org about the Mashel Massacre about five times. Each time I'm fascinated by his treatment of otherwise respected historic figures, most prominently Ezra Meeker. 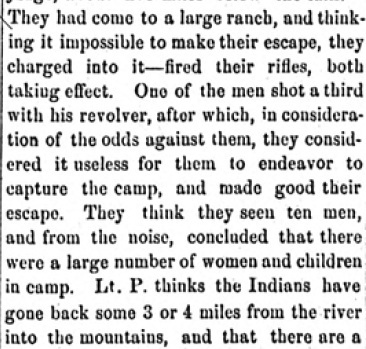 Meeker's description of the Mashel Massacre, in which up to 30 Nisqually tribal members were slaughtered by Washington territorial volunteers, is one of the popularly cited resources of the event. But, Emerson questions the honest of Meeker and another historian in the late 19th century James Wickersham. He calls them "men of questionable integrity." Emerson goes into detail taking apart Wickersham's admittedly shaky proof and Meeker's less questionable motives. He also does a pretty good job presenting the tribal oral histories about the massacre. Where Emerson falls short is other references to the massacre in contemporary media. While he cites this April 11, 1856 story on volunteer maneuvers in the upper Nisqually around the Mashel, he misses this one from April 25. That sounds like a very polite, not talking about the bodies reference to what we call the Mashel Massacre today. Without warning a group of volunteers storm an Indian camp in the upper Nisqually filled with "a large number" of women and children. Then, we find a very reference to 30 dead Indians on March 10, 1856 three years later in a much larger story in the Puget Sound Herald about a rash of white on Indian revenge killings. 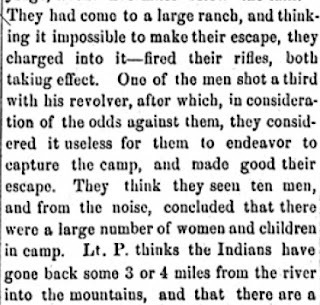 Granted, the article doesn't say "Maxon's troops on the Mashel in March 10, 1856," but the passing reference makes you assume that it was pretty well known what happened in the upper Nisqually. First, Emerson did not find the oral reports. I did. Secondly, there were two trips down to the Mashel that year. If you want to learn more about the second scout and the Mashel Masscare, check out my book Where the Mashel Meets the Nisqually. A lot of Emerson's info came from me.